Tiger - Diamond in the Ruff Rescue & Rehab, Inc.
Tiger is a blue and fawn colored 3-year-old boy. He came to us along with his daughter, Cricket, who has already been adopted. They were abandoned by their previous owner when he was incarcerated. This previous owner was an alcoholic, who abused Tiger and his daughter, making Tiger very timid and defensive. With some time and a lot of love, his defensiveness has been replaced by a tentative trust for humans. He is just now learning how to receive and give kisses, as he used to interpret a face near his as a threat. Almost immediately after intake, Tiger had two seizures in close proximity. After a vet visit, we determined that he has common epilepsy, which means that he can have seizures again if he doesn't take phenobarbitol daily. This drug is extremely common, and is on the cheap generic list ($4/month!) at most pharmacies. Although this condition is extremely cheap to treat, most shelters would euthanize a dog with seizures, not wanting to deal with diagnosing the problem. 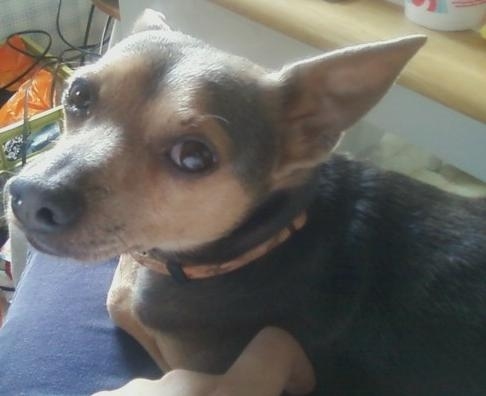 Initially, he was classified as a Chihuahua/Miniature Pinscher mix, but we now think he is more of a Chihuahua/Italian Greyhound mix, because of his long legs, tiny feet, and narrow chest. He loves running and playing fetch with his toys. He equally loves lounging in laps and on couches, getting as close as he can to his foster parents. When his foster parents come home, he dances on his hind legs around them in excitement. Tiger is still looking for his forever home. He would be perfect in a home with another dog that would allow him to continue building up his confidence. Small children would not be a match for Tiger, as he doesn't understand the language of rough child play. He also comes with a 2 week supply of his medication.